*For health and hygiene reasons riding underwear cannot be returned if the package has been opened. The material used in this product is stretchy like bike shorts. Choose the size you would normally buy in men’s clothing. If you are between sizes, buy the larger. These compression shorts are ideal for those who want some additional padding in the hip and tail bone areas. 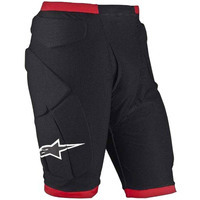 The shorts are much like any other compression shorts, but they have padding built in. A great supplement for gear without padding in these areas.